At first I thought this was a different butterfly from yesterday’s, but upon close inspection, I think that the bottom side of the wings are just completely different from the top side. I do believe it is a different flower, though. This entry was posted in Butterfly, Cee's flower of the day challenge, Flower images, Flowers, flowers of Mexico, images of flowers, images of zinnias, Mexican Flowers, Uncategorized, zinnias and tagged butterfly, Cee's Flower of the day challenge, images of zinnias, zinnia, zinnia image, zinnias on May 4, 2018 by lifelessons. 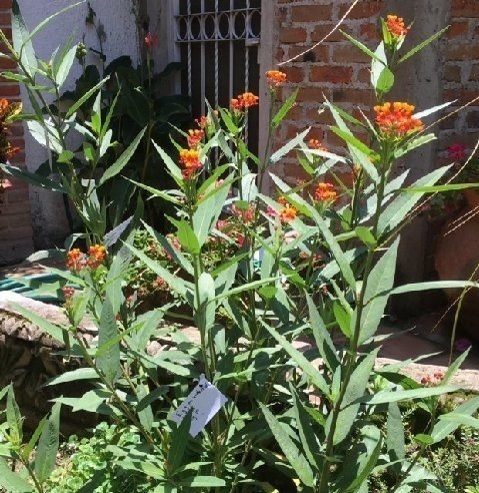 Since we live only a few hour’s drive from the mountains in Central Mexico where the Monarch butterflies from Eastern Canada and the U.S. migrate to spend the winter, we figured we’d better give them a helping hand by planting some milkweed in our garden. It is actually a more attractive plant than I imagined. And, it is the only plant on which Monarch butterflies lay their eggs. 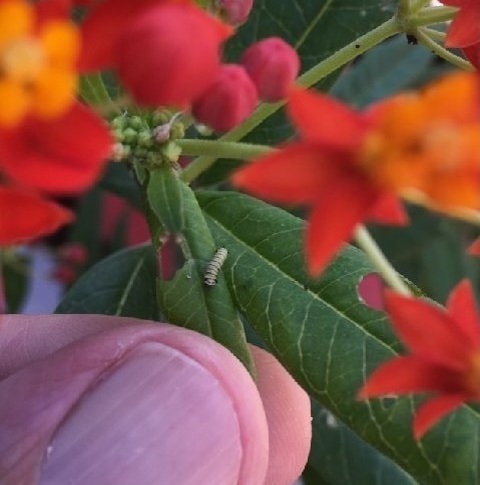 After just a week or two, Monarch’s found our plants and began laying their tiny white pearl-like eggs. 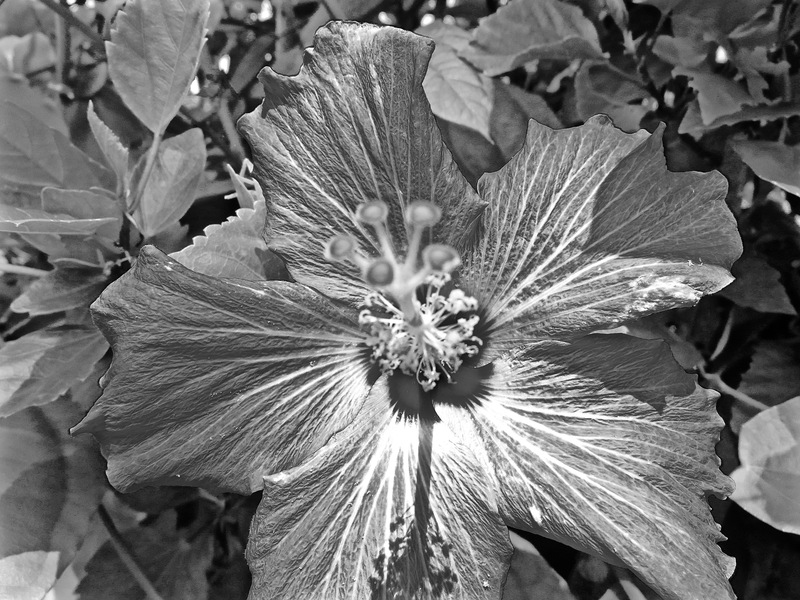 Here is one right where the sunlit and shadowed parts of the leaf meet. The eggs hatch about 4 days later. This little guy is busily munching on milkweed. 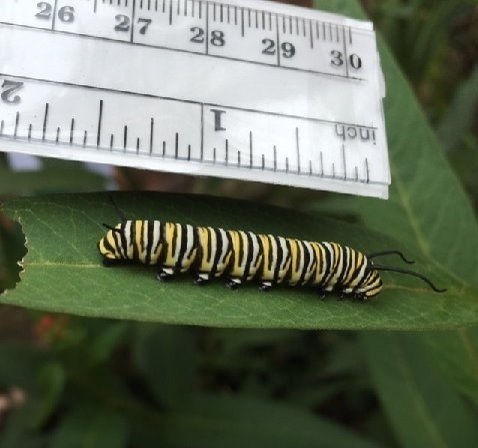 Milkweed contains some toxic chemicals that don’t affect the Monarch, but will sicken any predator that eats either the caterpillar or the butterfly. As a result, neither has to have camouflaged coloration. Their bright colors serve as a reminder to any predator who ever tried to eat one. About 15 days after hatching, the caterpillars have grown to this size. That’s when they stop eating and wander off the milkweed plant looking for a bush or tree on which to begin their metamorphosis into an adult butterfly. At this stage, we usually lose track of where they went, so we collected one and raised it in a screened container. After a day or two in the enclosure, the caterpillar hung by it’s tail and shed it’s caterpillar skin, replacing it with this shell like coating. In butterflies, this stage is called a chrysalis. Only moths make cocoons, which involve wrapping themselves in silk. 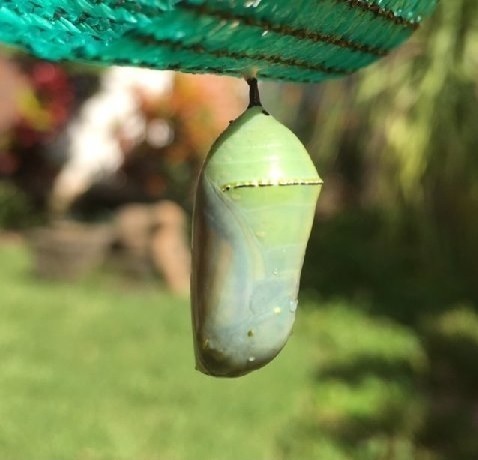 The Monarch chrysalis is not much bigger than a Lima bean, and it has shiny gold dots around one part, called a necklace. 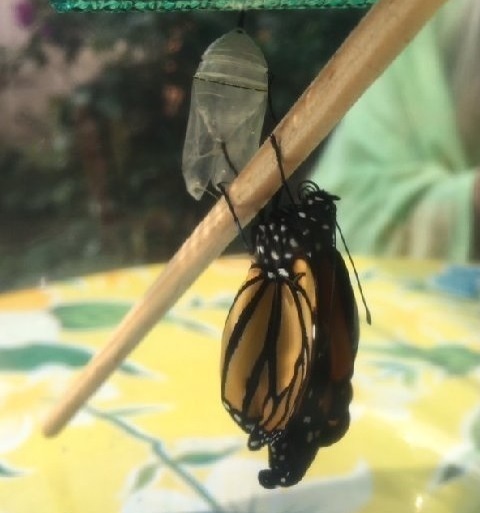 After about 11-12 days, the chrysalis begins to darken and become translucent. 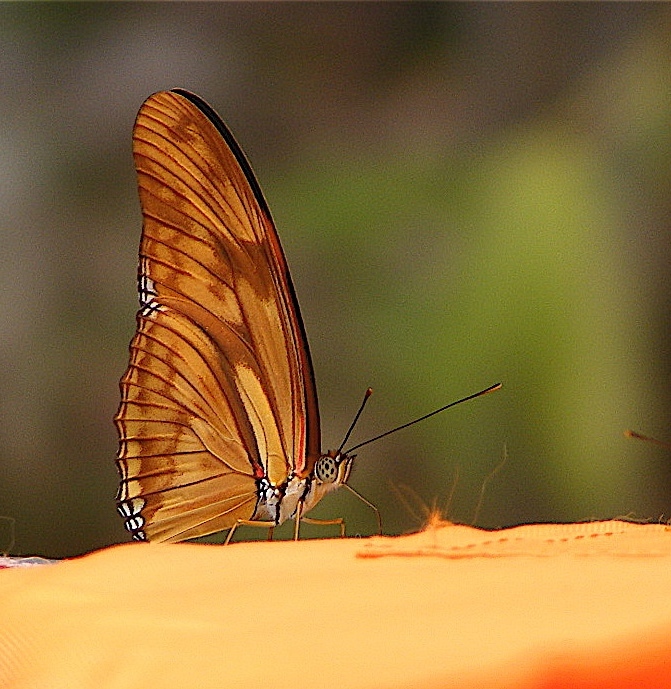 You can actually see the butterfly’s orange and black wings squished into the lower portion. 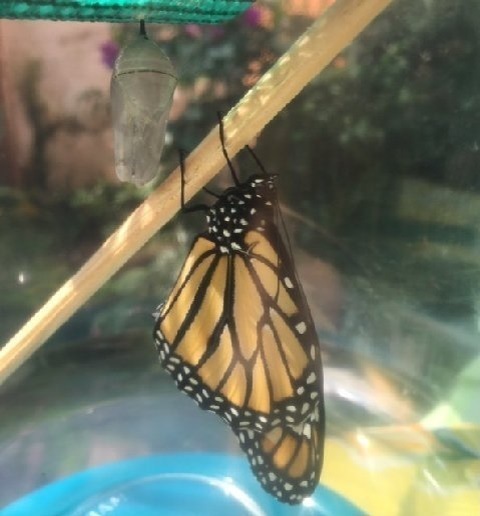 Our little guy emerged on the 12th day and crawled onto a stick to hang while blood was pumped into it’s shriveled wings. About two hours later, the wings were fully expanded. But he wasn’t actually flapping them, or trying to fly. We watched him for another hour or so until he decided to climb out of the container. Using a stick, I helped him climb out. He showed no reluctance to climb up the stick and onto my thumb. 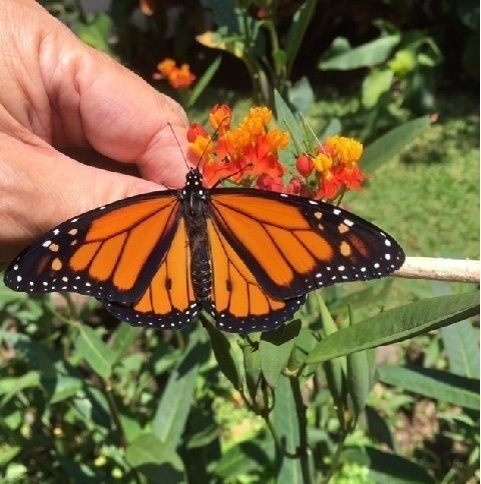 You may have noticed, I’m calling it a “him.” That’s because male Monarchs can be identified by the two little black dots in the orange part of their lower wings. 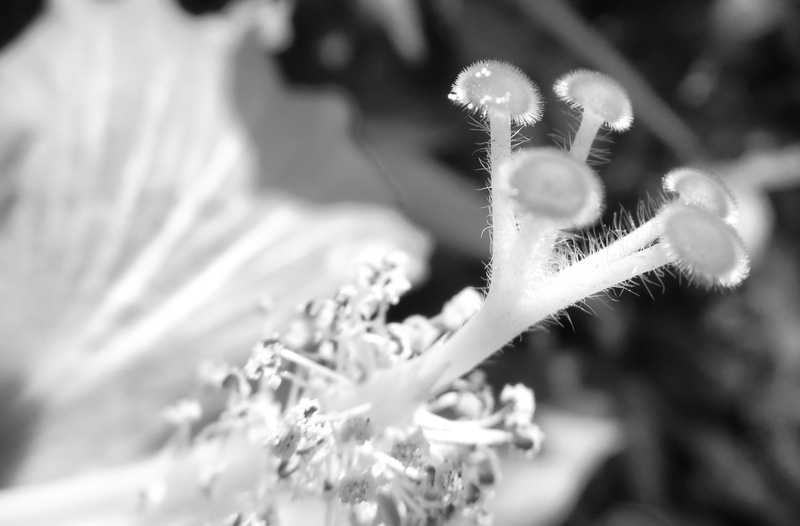 These are scent glands that will help him attract mates. 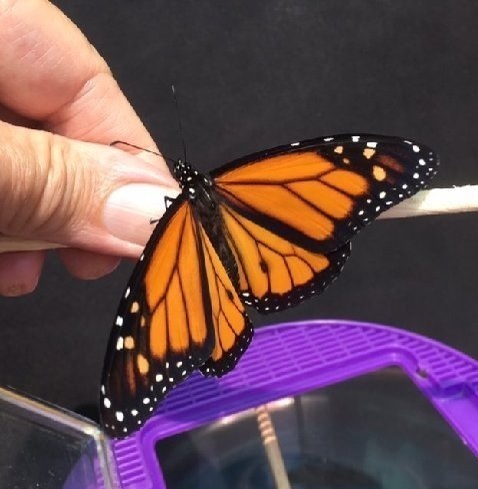 I carefully carried our Monarch out to the garden and put him on a milkweed flower. 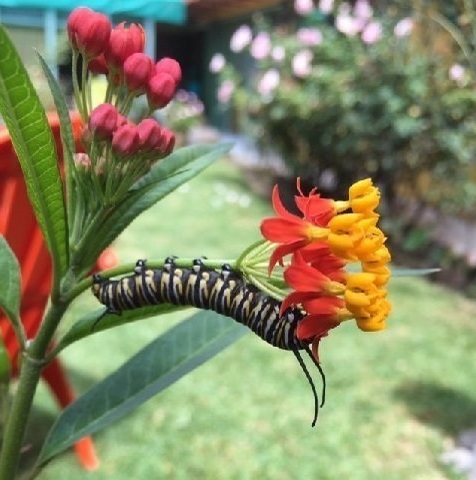 By now, we had named him Marty after my wife’s son who, years ago had lived in Santa Cruz, CA which has it’s own colony of Monarchs during the winter. Every year, the State Park puts on a Monarch festival. One year, Marty had volunteered to play the part of “Captain Monarch” who dressed in a butterfly costume and slid down a zip line to entertain the kids. He sat there quietly for about an hour, and then fluttered off to begin his new life. Live long and prosper, Marty. This entry was posted in Butterfly, Uncategorized and tagged butterfly, images of butterlies, Monarch, Monarch butterflies on September 6, 2016 by lifelessons. This entry was posted in Butterfly, Flower images, Uncategorized and tagged butterfly, Cee's Flower of the day challenge, hydrangea, image of butterfly on September 6, 2016 by lifelessons. This entry was posted in Butterfly, Flowers, Uncategorized and tagged flowers, images of flowers on June 15, 2015 by lifelessons.